Last week a reader thanked me for the info on flea and tick medications, and let me know that many big name pet stores still sell treats made in China that can be hazardous to a dog’s health. I don’t feed my dogs too many bones or cookies, but I decided to do a little research anyway. “Made In China” on pet related items has been a red flag since they had a pet food recall around 2007. In this case, the reading the label wouldn’t have helped the consumer, the Chinese companies had been dishonest about their product. Years later, there were increased reports of illness and death, believed to be cause by chicken jerky treats, “Made in China”. Tests were run on the treats, and no specific cause for the illnesses has been found. More recently, antibiotics have been detected in jerky made in China, but it isn’t something that could cause illness and death in dogs. As of this year it has been reported that Petsmart and Petco have stopped selling treats made in China. That seems like a win, but manufacturers can still use ingredients in their products and still say it is made in the USA. The other half of the problem, it still hasn’t been determined why these jerky treats have been causing dogs to get sick. It’s a mystery, just like the raisins… and after what I went through there, why even take a chance? Now, I’ve never run into the safety issue with the jerky treats because Yuki is allergic to chicken and I’ve never kept them in the house. Bacio also has a bit of a corn/grain sensitivity, so I am always reading the labels on dog treats. There are some ingredients to watch out for in dog treats (sometimes even your own food too!). 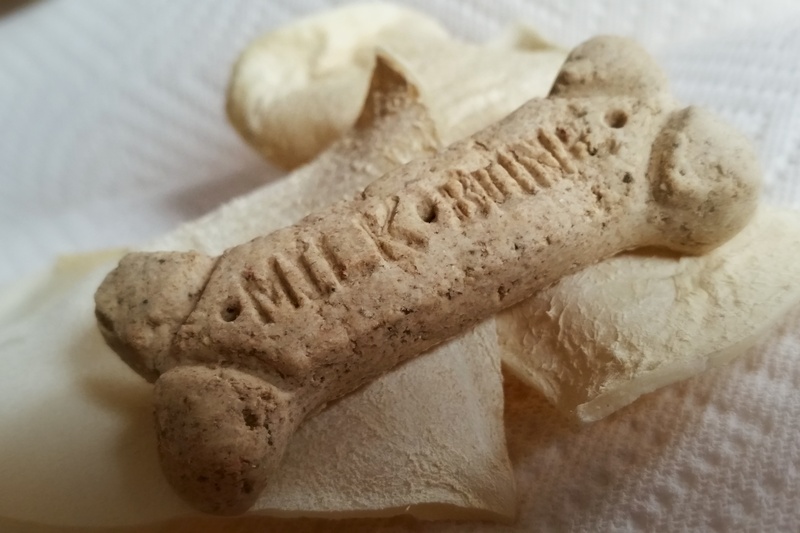 Milkbones were something I’d always give my dogs, the ingredients seemed rather harmless, except for two ingredients, sodium metabisulfite and BHA. Both are preservatives and both are, as you may have guessed, terrible chemicals for humans and dogs alike. BHA has been linked to kidney damage as well as certain cancers, it’s close relative BHT is actually banned in the UK because of how toxic it is. Sodium metabisulfite, another preservative, is listed in the National Institute for Occupational Safety and Health as a hazard chemical. It is used as a disinfectant and bleaching agent, and can cause breathing and gastrointestinal problems. Rawhides too are a questionable treat. They can be really good for your dog. Bacio needs them to keep his hyperplasia under control. These treats can be safe if you are buying good quality treats. I try to only buy made in USA, as other rawhide has had arsenic and formaldehyde found in it. I even read that Thailand was exporting rawhides made from dog skin! Artificial colors- Just like they have started banning them in our food, they have been found to cause cancers and illness in pets too. Sodium nitrate- usually used as a fertilizer or to make gunpowder, but it will preserve colors too! ***Now while reading up on this I found out that the pet labels are a bit deceiving, if a manufacturer buys a product to use in their treat or food, they just have to list that product. They are not require to list what the ingredients have been treated with. That seems incredibly scary to me! I know this post has gotten quite lengthy, but the last thing I wanted to touch on is “by-products”. I will be short and to the point, because this is already long and its also really gross. Pretty much by-product means the leftovers. It is the carcass of the animal, used grease, spoiled supermarket meat. By-products are anything left after the usable meat is taken for human consumption. This also includes 4d grade meat, dead, dying, diseased, and/or disabled animals, which are rendered by “extraction by melting that converts waste animal tissue into usable materials”. This is your by-product meal and fats in your pet’s food. So, be mindful of what you’re feeding your pup, and yourself. And lastly, there is no FDA definition for “natural”, it is completely different than using the word “organic”.